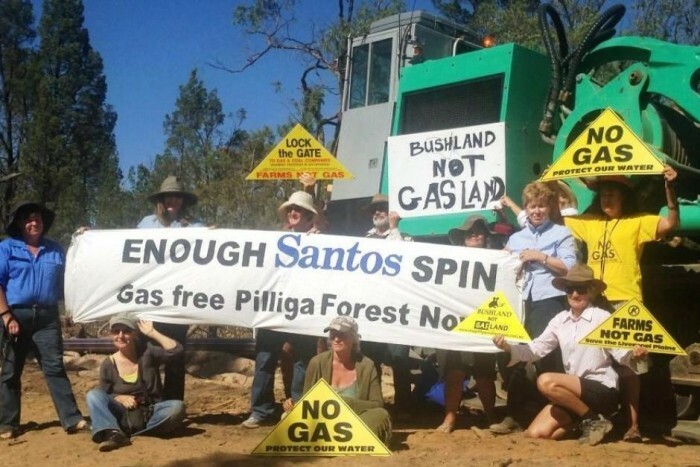 CSG company Santos has been found guilty of contaminating a Pilliga forest aquifer with chemical waste leaked from a holding pond, a by-product of one of their test wells. The aquifer was found to contain radioactive uranium products at 20 times safe drinking levels. The Environmental Protection Agency fined Santos $1,500 for the breach. Even more shocking than the pitiful fine, is that the EPA did not test the water at any point since being alerted to the waste leak in March 2013. Instead, the EPA accepted Santos’ own contamination readings and as such, never tested the water themselves. When a Santos supplied test indicated that the aquifer readings were back to normal, the EPA declared the site safe within 24 hours, without any independent testing being conducted. This worrying incident has left many doubtful of the ability of the EPA to monitor and regulate CSG activities, and to protect communities from groundwater poisoning. Despite mounting concerns, and the alarming EPA response to the contamination, the NSW government has approved the fast tracking of Santos’ CSG drilling project in the Pilliga. The project will involve the drilling of hundreds of wells in environmentally sensitive woodland, the construction of roads and other infrastructure, and the extraction of an estimated $2 billion worth of gas. This is the latest in a series of large scale mining projects approved by the Abbott government which pose serious environmental concerns. The political agenda of the government was made all too clear late last year, when leaked NSW government documents indicated that the words ‘Coal Seam Gas’ would be removed from official reports, websites and media releases. It would be replaced with the term ‘Natural Gas from Coal Seams’, a friendlier, more misleading expression with less environmentally destructive connotations. With Abbott about to sign Australia up for the controversial and secretive Trans Pacific Partnership, Australians will be left even more vulnerable to the interests of large mining companies, who will be able to sue Australia over environmental protection measures which reduce their profits. Australia is in a strong economic position and our environment is our biggest asset. When we threaten the livelihoods of our farmers, those unsung heroes who put food on the nation’s tables, and pander to greedy billionaires, there is something seriously wrong. This government is devoid of morals. This excellent Four Corners report aired 1/4/13 details the risks Australia is taking with CSG.